Wool Headwear Balaclava Face Mask Cold Weather Face Protection for Cycling, Skiing, Snowboarding, Motorcycling & Winter Sports. Ultimate Protection from The Elements of Winter. The Balaclava is constructed with our high quality Merino Wool fabric which is available in two color waves, Teal and Black. By using only the highest quality fabrics and bindings, the face mask will be your must-have for cold weather rides and you can depend that it will last through the seasons. Get insulation and protection from cold, wind, snow and rain. Our balaclava protects you against the elements of winter weather. Whether you blaze down the highway cycling or ski cross country or slopes, shovel snow or ride your snowmobile, this garment protects and insulates. Very comfortable to wear because it is a blend of fibers with wool to insulate and blended with a stretchy polyester knit to keep the moisture away. Our high tech wool blend is stretchy, and a breathable fabric to protect and insulate your face while wicking away moisture from perspiration and sweat. 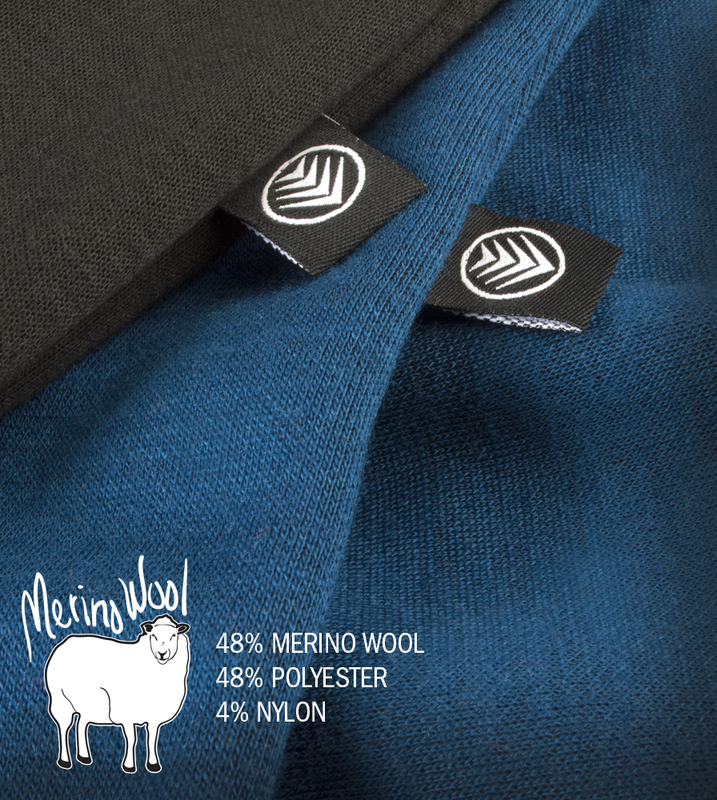 The fleecy internal knit has a hollow core polyester fiber that retains heat similar to polar bear fur. To prevent your glasses from fogging up, we designed the opening to have a breathability factory that will minimize condensation on your eye-wear. Fits men & women. Versatile for multiple sports and outdoor activity. It can be worn on its own or under a helmet. Wear it as a full face mask, open balaclava, half ski mask or neck gaiter. Ideal for all cold weather activity where the cold stings the face. Don't let cold weather prevent you from getting out! Ride in the winter with comfort and quality with the New Merino Wool Balaclava Cold Weather Face Mask. This wool balaclava is unique in that it helps to absorb and wick away sweat while it retains your body heat. It reduces the build up of sweat. Wear this under your helmet, it is anti-odor and completely breathable due to the unique blend of wool and polyester. This wool balaclava is perfect for cold mornings and windy days. It fits all sizes and can completely cover your nose and mouth or with ease can be pulled down to expose the complete face. The neck warmer insulates and retains your body heat. It keeps your hair in place and can also be worn to protect from sun exposure. Easy to wear with a thermal, insulation of the neck. Want less of a garment? Try our cold weather fleece head beanie. These caps will fit your head, keep your ears warm and insulate against the cold. Made in USA - American Fabric too!